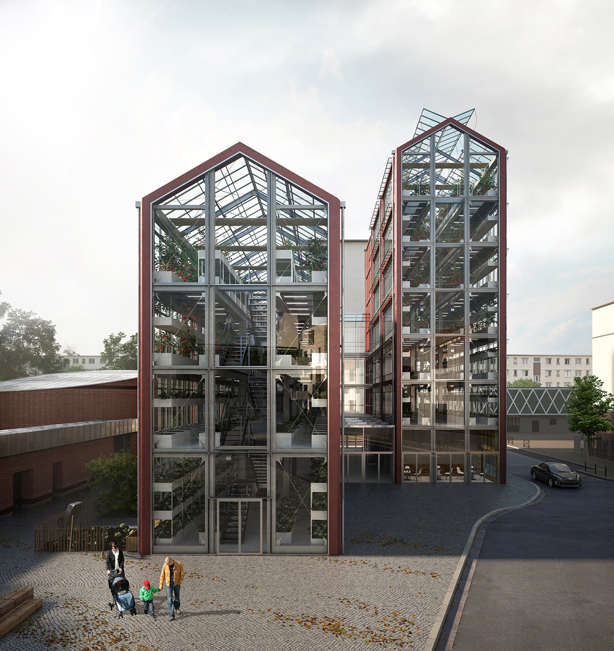 In a 1000 square meter multi-story glass greenhouse, French architecture firm Ilimelgo‘s design will house crops in a structure that maximizes exposure to sunlight and natural ventilation. 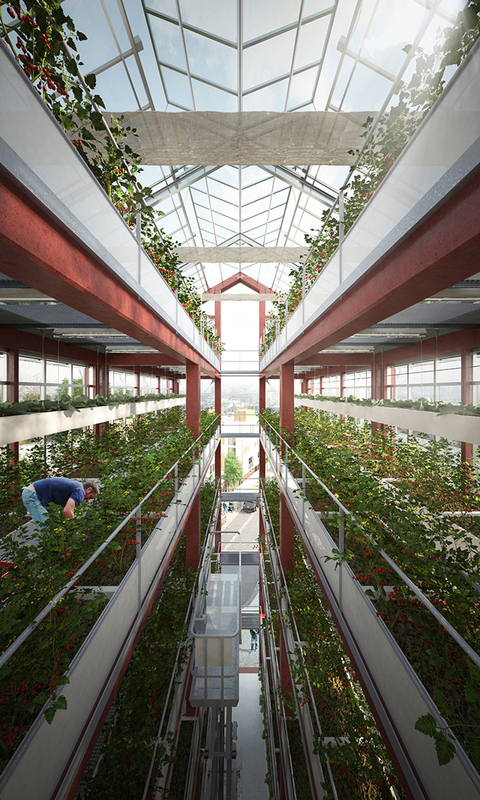 With urban population surges and diminishing agricultural space, the vertical farming complex is part of a trend that merges architecture with agriculture to meet increased demand for fresh produce in urban environments. The city of Romainville has a history of supporting sustainable, progressive and innovative alternatives to small plot-based agriculture. With this project, the city demonstrates its commitment to sustainability, education, and local economic participation beyond its rooftop and community gardens in a building at the intersection of traditional farming and technological innovation. 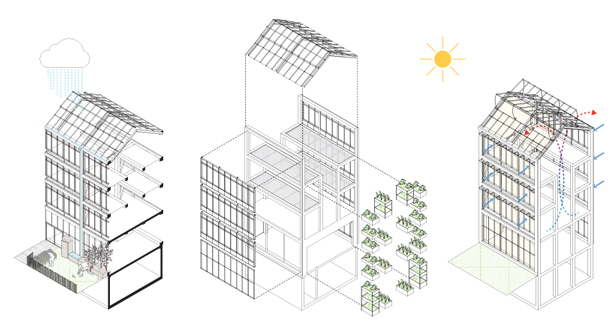 The structure is divided into two wings to take advantage of sunlight and limiting shade. 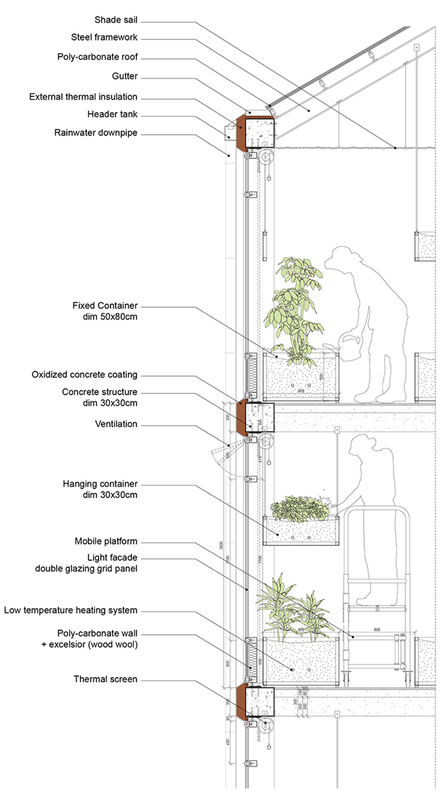 Organic building materials, including straw bale and wood fiber insulation, are central to the project’s sustainable design that consists of a rectangular prism with a triangular roofline, a reference to the locality’s existing architecture. The facility houses a mushroom farm, orchards, a henhouse, and seed germination laboratories. 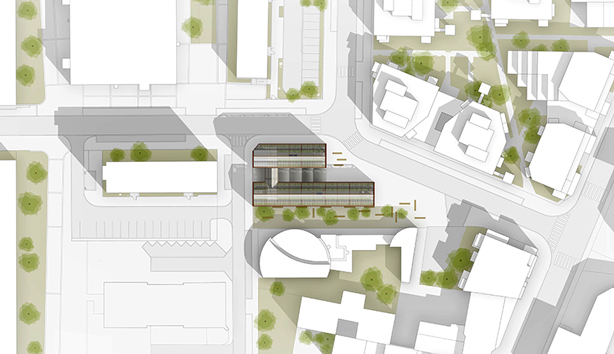 On the ground floor, the building will contain educational space to host workshops, an instructional garden for gardening and farming courses and a farmer’s market. 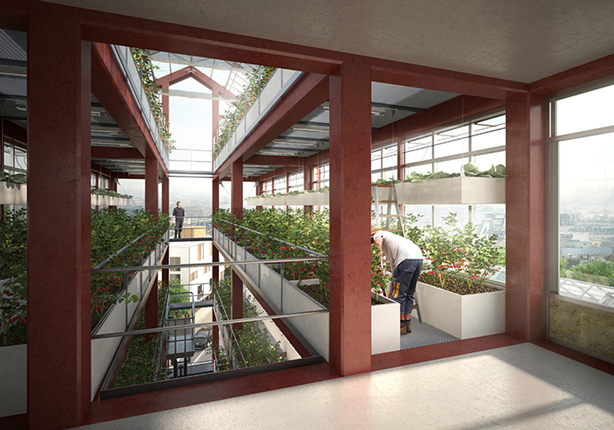 The upper floors will feature areas for bio-intensive farming utilizing permaculture containers for specific crops. In numerous ways, France has demonstrated a commitment to greening the country and to creating a much more sustainable environment. In 2009, French President Sarkozy asked ten teams of leading architects to create concepts for Paris as a city fully integrated with its natural environment. 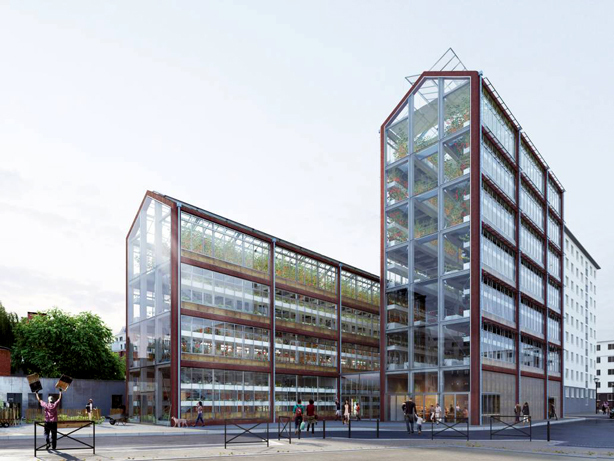 In 2015, France passed environmental legislation requiring all new buildings in commercial zones across the country to be either partially covered in plants or solar panels. Since 2000, the country’s capital has been an officially a pesticide-free zone. In 2005 the Paris-based National Apiculture Association launched a campaign to encourage beekeeping in cities. The largest project of its kind in the world, Paris boasts more than 400 beehives where the city’s bee-friendly zinc-coated rooftops make them perfect for apiaries, now found atop the Opera Garnier, Notre Dame, Grand Palais, the Assemblée Nationale, and the famed restaurant Tour d’Argent. Ilimelgo, in partnership with Secousses Architects, Scoping, Etamine, Terr’eauciel, and Land’act, submitted the winning entry in a competition sponsored by OPH (French public housing authority) and is currently raising funds for final delivery planned for Summer 2018.